So I tried a new thing this year, Walls of Water . 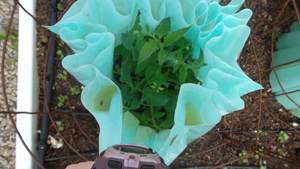 Basically, this is a product that allows you to plant your tender and very tender vegetables earlier, offering them some protection. It is like a circle of tubes that you fill with water. 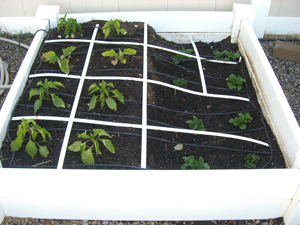 The water collects energy and heat from the sun and warms the soil and air around the plant. I bought two kinds, the original Walls O Water, and another kind. In the original one, all the little tubes to fill with water are the same size. In the other kind, there were a couple of super skinny tubes on each side, which made them harder to fill. The trade off–the other kind were not connected all the way to the top, creating a trough that made it easier to fill. Both worked equally well, as far as I can tell. This is what they look like. 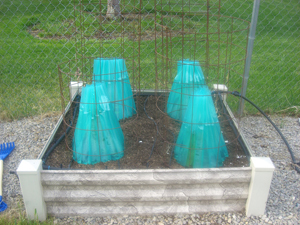 I put my tomato cages around them to protect them from little boys. 🙂 When it’s really cold, you push out a little water and make them like a tee-pee. This really keeps the warm air inside. But when the sun shines and temps rise, be sure to open them up or they fry the plants. Here’s a look inside. 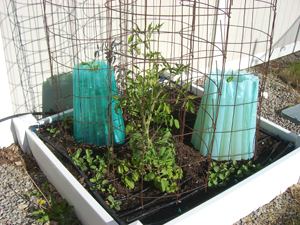 You can see the tubes with water (turning green from the sun) and the tomato plant growing happily. I just started taking my walls away, since the weather has improved and the tomatoes started growing out the top! This cherry tomato plant is the only one on the east side, which gets full afternoon sun. I think the walls of water made it too hot, and fried it. This plant would have been better off without the walls. But then check out this tomato plant. 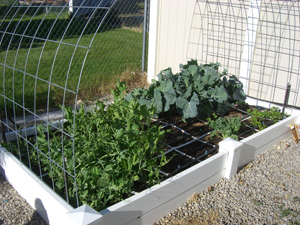 The squares on the cage are 6″ apart, so it’s easy to see that this plant is 18-24″ tall. Considering I’m in week 3 and would normally just be planting my tomatoes outside, the walls gave me a significant head start. 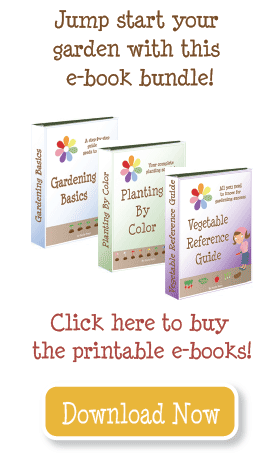 You can see my radishes growing nearby–I harvested two and more will be ready soon! 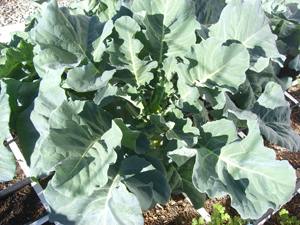 The plants were much smaller, but already had small heads of broccoli on them. I’m pretty sure I know what the problem is. Most plants have a window of time to transplant them, and I missed it. Instead of starting these from seed according to my schedule, I had a chance to buy some transplants early in the season. That was great, but I had to keep them inside for several weeks (almost a month) and by the time I got them planted they had missed the window. I will probably pull these up and plant something else in the space instead. And here’s a quick snapshot of my peppers and potatoes. The peppers look a little yellow and sad–I’m going to add egg shell water today, as well as fertilizer. The potatoes are great–I already covered them up with more dirt. Very cool walls of water! I’ve never seen anything like it. 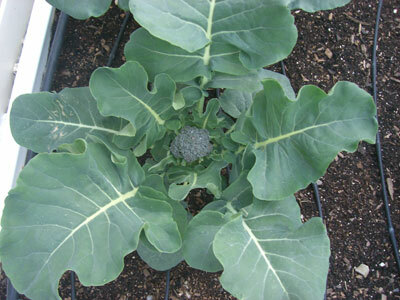 Checked on my broccoli this morning and I have little heads starting to form…don’t give up! I fertilize again with Blooming and Rooting, and continue to harvest until it gets too hot and the peas wither and die. Once you harvest your peas will they reflower and have more peas? Or do you cut them back? I am growing them for the first time this year and I am not sure what to do after I get peas. Don’t totally give up on the broccoli – at least transplant it into a 5 gallon bucket or something, it may still produce! I’d strip the fried branches off the cherry, give it some good fertilizer and it’ll come back. This is my first year experimenting with a bunch of different varieties of tomatoes, and I’ve actually killed a few (doesn’t happen often) but cherries are hardy little things. 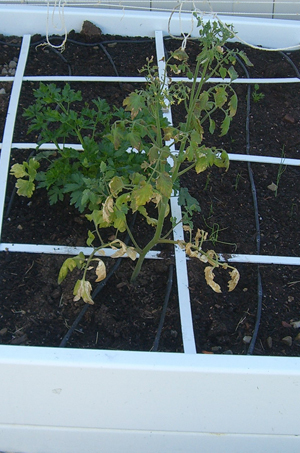 My Tommie Toe is 9′ tall – it went up the 6′ trellis and is working it’s way down to the ground on the other side.